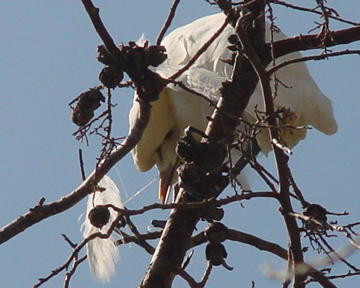 This Great Egret had gotten tangled in fishing line before landing in this tree. His head and neck were tied down tight, and the bird was dehydrated and emaciated. Rescued with the help of a PG&E cherry-picker truck, the bird made a full recovery at WildCare and was released. 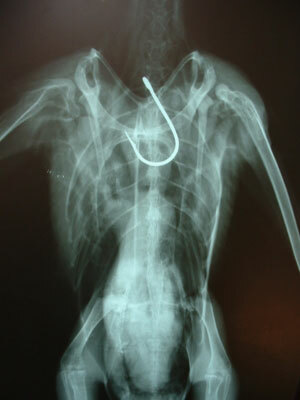 This xray of a bird shows the large fishing hook the animal swallowed. Surgery to remove this massive hook was unsuccessful and this bird died of internal injuries. Goin’ Fishin’? Don’t Give Me That Line! Among the most heartbreaking wildlife cases we see in WildCare’s hospital are those that could easily have been prevented. Prime examples of such preventable suffering are those patients that have become tangled in discarded fishing line and other manmade plastics. 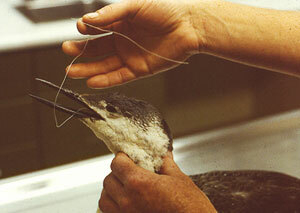 Animals entangled in fishing line can suffer from a variety of problems; the restricted ability to move can lead to drowning or starvation, vulnerability to predators, infections and even limb amputation as the animal struggles against the line. The increasingly large number of cases we see are just the ones lucky enough to be found and rescued. Like other forms of thoughtless behavior, discarded fishing line is also a danger to humans. There have been cases of divers who have run out of air before they were able to free themselves from entanglement. Boaters are familiar with the damage, risk and expense of line tangled in propellers or a boat’s motor or bilge pump. And of course the environment always suffers when littered. Plastic monofilament can persist in the environment for up to 600 years. In 2005 WildCare decided to do something about this problem. Led by Director of Animal Care, Melanie Piazza, the WildCare Fishing Line Recycling Program (WFLRP) was born. WildCare immediately installed a cardboard bin in our Museum to collect used monofilament line. The Berkley Recycling Center in Iowa provides these bins for free and recycles the used and tangled line into other products. The WFLRP also initiated the construction of more than 30 PVC bins to be placed outdoors at fishing areas as collection points for used line. The Marin Municipal Water District has placed these bins in areas around each of Marin’s reservoirs. MMWD monitors and empties the bins regularly. Bins are also installed at tackle, bait and sporting shops, and feature signage in both English and Spanish.This program is modeled on a monofilament recycling program that has been successful in Florida. Click for more information on this pioneering effort. So next summer, if you choose to go fishing, keep in mind the impacts on wildlife of discarded fishing line and hooks. Rather than tossing used line in a garbage bin where it will end up tangled in a landfill, look for a fishing line recycling bin or bring your used line to WildCare or a local bait shop for recycling. Carefully pick up discarded line if you see it lying around and do the same. If you find an animal entangled in fishing line, netting or hooks, bring it immediately to WildCare (call our hotline for assistance at 415-456-SAVE (7283) or contact your local wildlife rehabilitator to ensure the animal gets quick and effective treatment. Be Part of All of WildCare's Work to Advocate for Wildlife! Join our Action Alert Team!